How quickly do you ship? What carriers do you use? All orders are generally shipped the same day they are placed but may take up to 24 – 48 hours depending on the volume of orders. All orders processed during non-Business hours will be processed and shipped the next business day. We ship using Canada Post, Purolator, and UPS. We accept all major credit card brands as well as PayPal. In store we accept cash and credit. Once an order has been processed we are not able to edit that order. You can return the item you wish to exchange and create a new order for the item you would like to replace it with! Contact sales@happycrafters.ca with your order number if you need further assistance. How long does it take for the money to go into my account after a return is made? Upon receipt and inspection of your return, we will process a refund for the returned product(s) or ship a replacement product. You should see your refund within 24 hours if you used Paypal and 72 hours if you used a credit card. Does your vinyl work with all cutters? Yes! Our vinyl, both htv and adhesive can be cut with any vinyl cutter on the market. 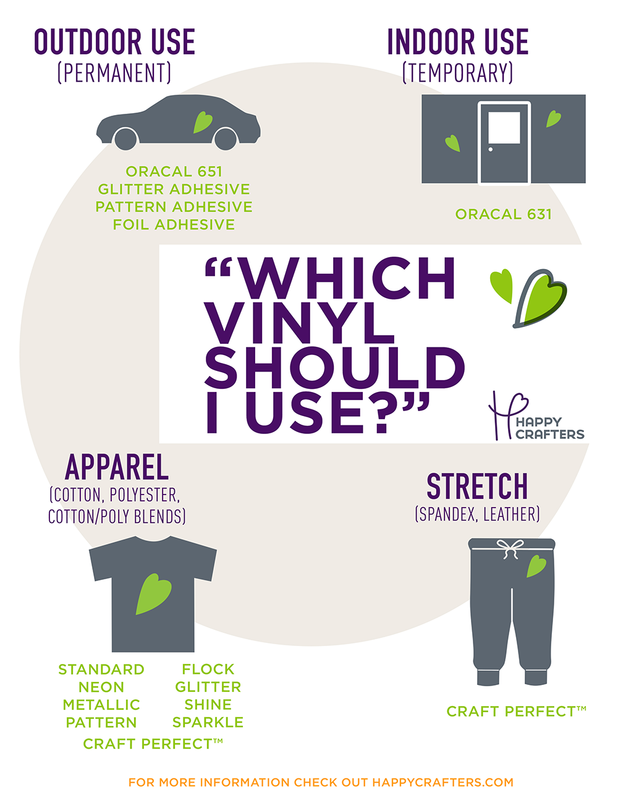 Whether you're using a Silhouette, Cricut, or a wide-format cutter, our vinyl will work. Is your vinyl CPSIA certified? ALL of our Heat Transfer/Iron-On Vinyl is CPSIA certified. 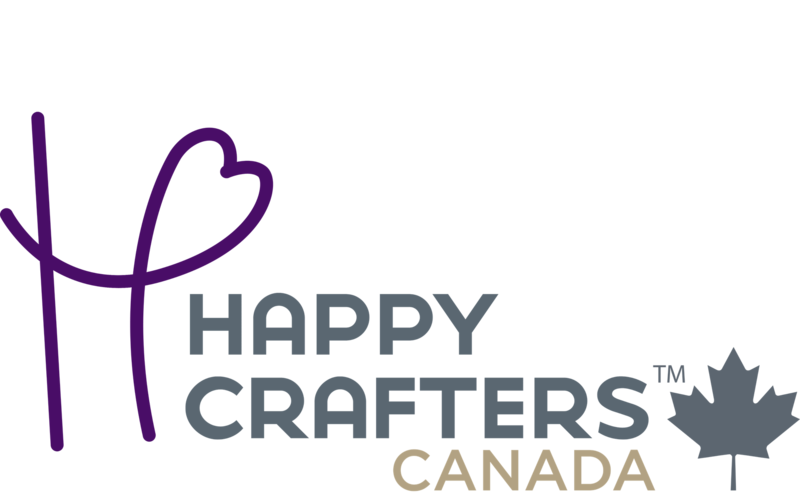 If you need a copy of the certificate, feel free to email sales@happycrafters.ca At this time, none of the adhesive vinyl (including Oracal products) is CPSIA certified. How do you clean craft vinyl products? If you are working with adhesive vinyl, you will want to hand wash those items. You can wash using any standard dish liquid. If you are working with htv, we recommend washing your shirts inside out, with cold water, and drying on low. I can't get my decal to transfer to my surface; what do you suggest? Make sure to thoroughly clean the surface before applying. Apply the decal with a little more pressure and squeegee from all directions. Also, try peeling the transfer tape by folding it back on itself and pulling the tape off while pushing down on the decal. How do I remove vinyl? You can remove adhesive vinyl with either a razor blade or by using a squeegee and some elbow grease. You may have to use something like Goo Be Gone to remove the leftover adhesive. To remove htv, try finding acetone and applying it to the back of the shirt and design. You can also try reheating the vinyl and use tweezers to pull the design off. Then, reheat to burn off any leftover adhesive. What vinyl should I use? We are open Monday to Friday from 9 am to 5 pm EST. We are located at 2021 #3 William Parkway E. Brampton. We currently have a Flat Rate shipping policy of $ 9.95 and Expedited Shipping for $17.95 ( Expedited only for Ontario and Quebec customers ). Expedited available for all other provinces, please inquire.